First of all just want to thank you publicly for all the help in equipment sponsorship for me, and fundraising for SELF HELP. And to Dion for the all the time and energy put into preparing the bike for the journey. It would be a very different trip without your involvement! At the moment I’m in the town of Bobo-Diallaso in Burkina Faso, and am taking the opportunity to catch up on a number of things. It seems to have been all go so far, and hard to believe I’m down this far! I wont bore your website visitors with the travel details (see www.kilkennytocapetown.com/updates to be bored by that), though some may be interested in how the bike has performed, how the modifications have been, and what equipment I’ve found to be useful. On leaving the pleasures of Marrakech in Morocco behind me – yes Dion, Carlota made it over for a visit - I had the feeling that was the start of the real journey. And that was about right. Up to then things were pretty cruisy - Morocco is an enjoyable country to travel in. The roads are generally excellent and great fun with winding bends, good surfaces and little traffic, while the food and accommodation are cheap, and the people geared for tourism. I recommend it as a magnificent biking destination, though as a solo traveler it can be a bit of a pain as you’re constantly on the defensive from touts and salesmen. South from there, the terrain is less hospitable, the huge desolate spaces of Western Sahara and Mauritania opening up. My F650 was slightly underpowered for those distances. But then that’s not why I selected it. Generally speaking I’ve been very happy with the bike’s performance. The main attractions in selecting the BMW F650 Dakar were the balance between comfort on the road and ability on piste, or off road. A larger bike would deal with the long distances with more comfort - though would limit your options and be a liability in some of the road conditions further south. A lighter motocross style bike like the XT600, a popular choice among some for this type of travel, allows great flexibility going off road but would I imagine not be the most comfortable day after day with the big distances. I also opted for the newer electronic fuel injection (EFI) engine. The obvious risk is an inability to repair it if need be, a carbureted engine simpler to diagnose and repair. However after much research beforehand, I was confident of the Rotax engine’s reputation for reliability and the newer EFI F650’s record. It could also happily deal with varied octane levels, leaded fuel and changes in altitude and had far better fuel efficiency - I’ve had 27kms to the litre at times. A significant factor when fuel is the major expense for the trip. So far (touch wood, or Alhamdallah as they say here) I’ve had no problems on that score. I am finding the weight of the bike a bit restrictive at times, but against that the comfort on the long distance traveling can’t be denied. Thanks to Touratech in Germany who gave me a very attractive deal, I bit the bullet and invested in the auxiliary 22 litre fuel tanks. I really wasn’t keen on the idea of strapping on jerry cans to an already heavily loaded bike, as well as riding with that feeling of anxiety that settles down on you as the miles pass, fuel needle goes down, and you’re not sure when the next availability is! That’s not an enjoyable way to ride. One little design flaw to note is that the seat that comes with it – more comfortable and slightly higher then the original – presses down on an electrical connection coming out of the fuel tank underneath it. It eventually severed one of the sender wires, leaving the speedo and milometer dead and ABS inactive (no harm). I reset the milometer at every fuel stop to gauge when the next one is needed, so until I discovered the source of the problem, I was relying on the GPS (see below) for a record. This meant remembering to switch it on every time. I’ve hacked away an indent under the fiberglass seat to accommodate the electrical connector a bit better. Tyres were another major consideration, and the good folks at Cambrian Tyres in the UK – through the good offices of Iggy - generously sponsored me Continentals. I had bought Conti Escapes from Iggy before on his recommendation and was very happy with them - good wear and a fair grip on looser surfaces. What I really had my eye on was the TKC 80’s, the tyre of choice by many going off road. I’d had the opportunity of using them on the BMW two day Off Road course in Wales. Simon Pavey, the Dakar Rally veteran and course coordinator uses them for his fleet of bikes and they were a revelation to me, not having been off road before. It certainly helped the confidence belting around the dirt course when you felt your wheels weren’t going to go from under you. So I fitted Conti Escapes for the first part of the journey down through Europe, with the idea of couriering a set of TKC 80’s down to Malaga or Morocco. When I heard the delivery price Iggy was quoted for this I insisted on strapping the ‘knobblies’ on and carrying them down myself. And I’m still traveling with two sets of tyres! The TKC’s are great in sand and piste (hard packed sand, or sandy gravel), but I was quite alarmed at their wear after extended use on tarmac. And as there’s a fair few miles before the next tyre drop - Cameroon - I find I’m changing them as the terrain demands, conserving the TKC’s by using the Escapes for long stretches of tarmac. This has worked out really well, apart from the extra weight. I have become fairly used to changing tyres at this stage, and at times get help from the many roadside tyre repair shops in every town along the route, with their piles of used tyres outside advertising the business. They have for the most part very basic equipment consisting of a couple of tyre irons, bowl of water and compressor – usually pull started like a lawnmower. I always take off and put on the wheels myself - despite the often enthusiastic attempts to do it - though if available will let someone else do the taking off and putting on the tyres, making sure care is taken with the tube (having learnt the hard way that’s the easiest way to get a puncture!). Standing over the tyre using their feet like another pair of hands, they slowly and expertly prize it off the rim. One guy had a tyre iron in one hand and (blunt – I checked!) long screwdriver in the other. Their practiced hands seem to be able fit the tube valves into the rim a lot easier than my at times hot, sweaty and frustrating attempts. And of course it only costs a few bob and I’m contributing to the local economy. I’ve found breaking the bead off the rim is a straightforward affair of pulling the bike over while on the centre stand and pressing down on the tyre with the extended side stand. Usually a large rock under the sump when the front wheel is off! The plastic rear mudguard is history by the way, broken off somewhere on the road the Timbuktu! Didn’t need it anyway, and means a few less bolts to undo. I haven’t had a puncture yet - Alhamdallah - though in writing that I know I’m tempting fate. Until Nouakchott in Mauritania I was riding on the Escapes with UltraSeal in the tubes. When changing tyres there for the first time, I put on HD tubes which I’d picked up in Spain, carrying the Ultrasealed ones as spares. So far, so good. A DID X-ring chain and steel sprockets were fitted before I left. 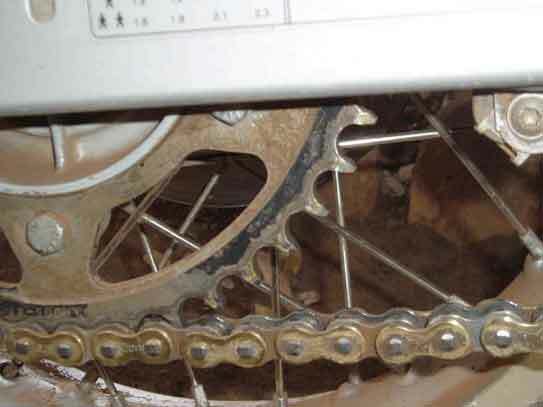 I have avoided lubricating the chain for the most part because the amount of dust and sand in the air mixed with any oil acts as a grinding paste. I carry a spare 15 tooth (as opposed to 16) front sprocket and will probably fit it in Cameroon when more control will be needed at slower speeds over worse terrain. The centre stand has been a useful addition. Dion did a great job adapting a regular F650 stand for the higher Dakar and I find it useful for attaching panniers, above mentioned tyre changes, cleaning (the odd time!). The side stand is still a problem – other Dakar owners will understand - being too short putting the bike at too much of an angle, particularly with the extra weight of luggage. It’s a habit now when stopping to look for a slightly higher left side or dip for the front wheel. Brian my brother threw me a square of marine ply before my early morning departure from his house for the Rosslare ferry, which I carry in my tank bag. Really useful, necessary, for softer ground. On the piste to Timbuktu. “On this stretch of track the going was really tough with lots of sandy piste, but most difficult… the dreaded corrugations. And these were serious, bone rattling, bike damaging, spirit destroying corrugations. That went on for hours. The usual way to deal with this is to take courage and open the throttle to about 80+ kph, which can serve to smooth out the bumps. But this of course means you have little control as contact with the surface is reduced. Holes, ruts and bends become interesting to negotiate! Anyway at times the speeding up trick didn’t even work on these corrugations. I had passed earlier a 4x4 stopped on the side, and as this was hours from anywhere paused to ask if they needed help. One guy shook his head sadly as he pointed to his tyre – torn and in tatters off the rim. And apparently that was his spare. Wider footpegs have been really useful, a necessity nearly, as they allow me to stand easily when needed on loose surfaces (bringing my weight from the saddle lower down to the footpegs increasing stability) as opposed to more of a balancing on the original pegs, particularly in heavy motocross boots! I adjusted them a little lower as well which allows a more comfortable riding position. A clear plastic adhesive strip, which Dion stuck over the headlight for protection, is still there doing its job. I fitted a wire mesh over the radiator (a few euro from the local garden centre) secured with little wire ties through drilled holes in the plastic surround. The radiator has been giving me a little cause for concern. The day before leaving Ireland it developed a leak, lost all the coolant and overheated. Loath to strip the thing down and find the problem at that late stage, I went for the easy option - threw in some Radweld - which seemed to do the trick. After that it was ‘out of sight out of mind’. But as we know, these things don’t just ‘go away’ and after giving the bike a real hammering on the road to Timbuktu, a few problems developed – including leaking rad. I was hoping the rattling had just shaken the hardened solution loose, so put in some more Radweld I carried and topped it up with water. That seems to have alleviated the problem, though I have a niggling feeling it needs to be looked at and will consult my cd manual to see how involved it is to take off and repair. Spare clutch and throttle cables have been routed next to existing ones for ease of changing though not used yet, and an accessory socket has been fitted on the dash for charging my mobile and laptop when if needed. 35mm high handlebar risers give better control when standing and feel a little more comfortable when riding. Among the spares on board were extra mirror bolts. As the two mirrors have been broken at this stage from spills, I ride with just the left one - the end cut off and new bolt fitted. Many more breaks and it will be down to a stub! 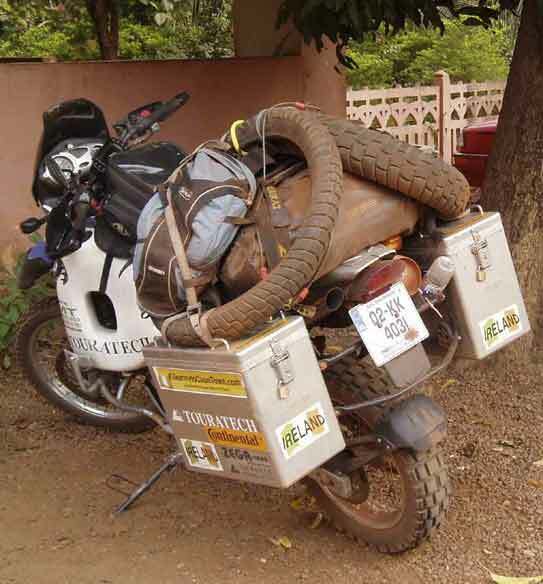 The panniers and frame sponsored me by Touratech I am very pleased with. Thin gauge aluminium boxes and tubular steel frames combine lightness with sufficient strength and are not too heavy, something I was very conscious of when planning. The design as well is very clever, a simple yet secure mechanism for attaching/ detaching boxes to the frame. BMW supplied me with a Garmin GPS unit which, while not all that necessary so far, has been useful. It saves taking out maps to consult, at any time giving me an idea of where I am and what direction I’m heading. Particularly useful when trying to leave some cities. A large Ortlieb dry bag, dust and waterproof and tough, is strapped across the back seat and is doing its job well. I’ll probably find some way to send home the 10 litre water bag, to be secured on top of a pannier, which hasn’t been used yet, as a small ‘Source’ backpack with 2 litre water capacity and drinking tube (like a Camelbak) seems to be all I need, along with a spare bottle of water. Being able to drink while on the move has proved to be really useful, as you tend not to stop so often to drink, when keeping hydrated is really important. The Pacsafe - a lockable wire mesh to secure loose or soft luggage similarly hasn’t been used but I’ll keep that. I thread a locked cable through the spare tyres, Ortlieb handle and bike frame for security, putting it through my helmet when I leave the bike. For gear I have an Arai Tour-X lightweight enduro helmet with detachable visor. Remembering Martin Finnegans advice in Extreme 45 (name drop – fastest man in Ireland, brought up on motocross), I bought some orange tinted goggles in Malaga which give improved visibility in dusty conditions (not used yet). I need to wear earplugs for the sound. These are a nuisance as they get dirty every time you roll them in your fingers before inserting, not very hygenic. Despite the warm conditions I wear Oxtar motocross boots, with strong plastic protection for ankle and shin. Though a little uncomfortable in the heat and for walking anything longer than about half an hour (they’re quite inflexible), you get used to them and I don’t consider them a problem. They have saved my lower legs a few times! I wear the BMW Rallye 2 suit, the same used by competitors in the Dakar Rally. If it was good enough for them… It has a lightweight detachable lining for colder conditions, the jacket of which I wear in the evening when needed. With all the usual body armour in another zip on lining it is quite heavy, but is made of breathable yet tough cordura, and I’ve rarely felt too warm - yet. I follow advice I received from another desert rider not to open the ventilation zips as this would dehydrate me quicker. Keep it zipped up and keep the moisture in! Underneath that I wear “Dry Flow” underpants and shirt made from polyester that, in the jargon, ‘wicks’ away moisture from the skin to outside. At first I wasn’t too sure about it, feeling hot under its elasticated pressure but having got used to it find it does indeed do what it says, as opposed to cotton underpants which tend to stay damp from sweat. Its easy as well to rinse and dry. Other equipment is a Vango 900 sleeping bag, perfect, and a silk liner which has been really useful. In the first part of the trip sleeping in cheap hotels, on close examination there were invariably the previous occupants pubic hairs on the sheets, so I had my own sheet! In very warm conditions it serves as adequate cover on its own, in the cold augmenting the sleeping bag’s protection. Joe Cotter from Kerry came up trumps at the last minute and supplied a really lightweight (< 2kgs) one man MSR Hubba tent, which really has been great. Free standing so ideal for sand where pegs are of limited use, and easy and fairly quick to erect, I have been delighted with it. He also supplied a lightweight MSR Dragonfly stove which burns regular petrol – ideal for a biker. Iggy Clarke has been vital in getting support from suppliers for the project, as well as being a galvanising force in getting funding for the charity Self Help! Iggy you’re a star. Dion Byrne - Mechanic working with BMT, has been a brilliant help in preparing the bike, and a great support. Conor McRory has been very supportive since first being approached.